Directed by David Lynch and written by Lynch and Mark Frost, the pilot episode of Twin Peaks entitled Northwest Passage revolves around the mysterious murder of a high school beauty queen in a small town as a FBI agent begins the investigation leading to a series of strange events during the case. Along the way, the small town of Twin Peaks, Washington begins to unravel where locals try to figure out who killed this beauty queen named Laura Palmer (Sheryl Lee). It’s an episode that not only sets up the tone of the entire series with its mixture of small town charm with elements of dark humor and mystery. It’s an episode that plays into a town that may seem quaint on a superficial level but Special Agent Dale Cooper (Kyle MacLachlan) would realize that Twin Peaks is anything but a small logging town. 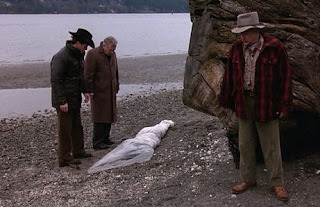 There are many things that goes on as it is all told in the course of a day where it begins when Pete Martell (Jack Nance) is about to go fishing where he would find a woman’s body wrapped in a plastic bag as he calls the police. Though Sheriff Harry S. Truman (Michael Ontkean) would lead the investigation initially, it is until Cooper comes in where Truman would aid him in the course of the entire day. Upon the news that Laura Palmer was found dead near the lake, the town would lose their mind as her boyfriend Bobby Briggs (Dana Ashbrook) is initially a suspect though Cooper thinks he didn’t do it. Affected by the news is Laura’s best friend Donna Hayward (Lara Flynn Boyle) as well as a classmate named James Hurley (James Marshall) who is later revealed to be Laura’s secret lover and later a suspect. With Laura’s parents Leland and Sarah (Ray Wise and Grace Zabriskie, respectively) in shock, there are other elements in the episode that happens as it relates to its offbeat tone. The town’s wealthy businessman Ben Horne (Richard Beymer) is in cahoots with the logging factory’s owner Josie Packard (Joan Chen) into buying the land much to the dismay of her sister-in-law Catherine (Piper Laurie). Meanwhile, Ben’s daughter Audrey (Sherilyn Fenn) is another of Laura’s classmate who likes to cause trouble as she would ruin one of her father’s business deals. Another thing that happens which definitely forces Cooper to stay is when a young woman named Ronette Pulaski (Phoebe Augustine) was seen walking on a bridge half-naked as Cooper would later find a piece of evidence under Laura’s fingernail. What the episode does is essentially set a tone for the entire series where it has this strange mix of mystery and romance with elements of offbeat humor. The teleplay by David Lynch and Mark Frost manages to find a balance with the tone where it has something that feels like an idyllic small town in the Pacific Northwest where everyone knows each other. Once the whole town learns that Laura Palmer is dead, it become clear that everything they thought they knew about not just her but themselves isn’t very real. Even as there is also this sense of looming tension that is happening where Palmer’s death is a catalyst for characters to finally unravel. Most notably Briggs who thinks Hurley is the one who killed Palmer even though Briggs is having an affair with a diner waitress in Shelly Johnson (Madchen Amick). While the episode does have a lot of romantic entanglements that includes James’ uncle Ed (Everett McGill) who has feelings for the diner owner Norma Jennings (Peggy Lipton). Lynch’s direction is very mesmerizing for the way he captures the life of a small town as it is a character in the film from its waterfalls, its lake, the streetlight, the biker restaurant, and other things. Among the aspects that is very offbeat is the way Cooper is entranced by the trees in the town and its surroundings as well as talking the coffee he drinks which he always says “damn good coffee”. It’s among the many quirks that Lynch would provide into the story as it also includes a few locals such as the log lady (Catherine E. Coulson). Still, Lynch would maintain something does play into traditional elements of suspense such some of the interrogation and scenes where characters try to recount what happened and where were they the night before. With its low-key yet evocative cinematography, intricate sound design, Patricia Norris’ costumes, its colorful art direction, and a methodical yet low-key approach to the editing. Lynch creates a pilot that doesn’t play by the rules nor is it afraid to be weird. Even as it’s not afraid to make fun of soap opera elements that are often over-dramatic where Lynch knows where to spin that and find either something funny or very dark into these elements. Lynch’s compositions as a director do maintain something that is more akin to classic television rather than something cinematic where it maintains an intimacy in its close-ups and medium shots. Adding to its sense of humor and melancholia is Angelo Badalamenti’s score where it uses jazz for its humor while going for ambient textures in its electronics for the dramatic moments. Overall, Lynch creates a very eerie yet thrilling episode that plays into a town unraveled by the death of a beauty queen. The episode’s cast is incredible as its standouts include Sherilyn Fenn as the poor little rich girl Audrey Horne, Madchen Amick as the young married waitress Shelly Johnson, Joan Chen as the logging factory owner Josie Packard, Jack Nance as Pete Martell, Piper Laurie as Catherine Martell who hates Josie, Peggy Lipton as the diner owner Norma Jennings, Everett McGill as James’ uncle Ed who runs a gas station and is married to a one-eyed woman, Dana Ashbrook as the rebellious Bobby Briggs, Michael Ontkean as Sheriff Truman, Ray Wise as Leland Palmer, and Grace Zabriskie as Susan Palmer. The best performance of the episode is Kyle MacLachlan as Special Agent Dale Cooper who brings a lot of offbeat humor as he constantly talks to a tape recorder and talks about trees where it adds to the quirkiness. Lara Flynn Boyle and James Marshall are terrific in their respective roles as Donna Hayward and James Briggs who both cope with Laura’s death. The pilot episode of Twin Peaks is a phenomenal one in terms of establishing what is happening and who the characters are. Especially as it creates something where it is a mystery but it’s also something more where it is engaging on a dramatic level while also being very funny. It’s a reason why the pilot is definitely thrilling as a great way to start the series that is Twin Peaks. I've only seen a few episodes of Twin Peaks when it was still on TV, so I can't remember much of it. I'm curious about the upcoming new series, or is it a TV movie? But only when Lynch is involved though. From what I've heard. Lynch is back on board and he will be directing 18 episodes of this new yet limited series. I'm excited about it as I'm doing the entire first season this month. I love Season 1, the story is so dense that I needed to see it twice to take in all the details and characters. There are so many things to like, the music, humor, quotes, small town charm, etc. You should try and see the show with the log lady intros for each episode. @Chris-I'm currently watching Episode 1 as it's already going great. I don't think I have the log lady intros though she is a hilarious character.